"Nonviolence is a powerful and just weapon. which cuts without wounding and ennobles the man who wields it. It is a sword that heals." - Martin Luther King, Jr.
History weighs heavily in August of 2014: the centenary of the start of World War 1; seventy fifth anniversary of the signing of Molotov Ribbentrop, the treaty that triggered World War 2 by splitting Poland between Nazi Germany and the Soviet Union; thirty five years later, leaders of the Khmer Rouge are finally brought to face justice before an international tribunal; 34 years on the 31 of August 1980 the Polish Solidarity union came into existence; and Cubans observed the 20th anniversary of a mass uprising in Havana known as the Maleconazo that sparked another huge exodus of tens of thousands of Cubans fleeing to freedom. Within this somber month of needed reflection on what not to do there is an incident that took place that needs to be remembered on what needs to be done. In addition to dismembering Poland, the Molotov Ribbentrop Pact placed the Baltic States under Soviet control. 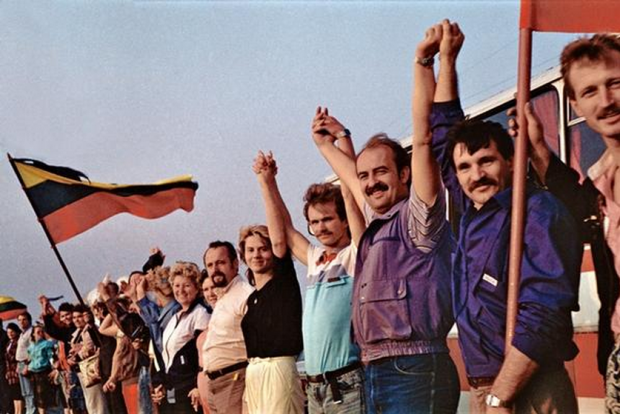 A nonviolent moment twenty five years ago that ended up liberating Lithuania, Latvia and Estonia brought an end to this part of Nazi-Soviet non-aggression pact and it was called the Baltic Way. On June 4, 1989 the Solidarity labor movement won in free elections and the Polish people finally regained their sovereignty after nearly 50 years under totalitarian oppression. They did it nonviolently. So did the people of the Baltic states when two million Latvians, Lithuanians and Estonians joined hands together in a giant human chain stretching 370 miles on August 23, 1994. Fifty years to the day after the treaty that brought them so much grief had been signed. On 23 August 1939 foreign ministers of the USSR and Germany - Vyacheslav Molotov and Joachim von Ribbentrop, as ordered by their superiors Stalin and Hitler, signed a treaty which affected the fate of Europe and the entire world. This pact, and the secret clauses it contained, divided the spheres of influence of the USSR and Germany and led to World War II, and to the occupation of the three Baltic States - Estonia, Latvia and Lithuania. 50 years later, on 23 August 1989, the three nations living by the Baltic Sea surprised the world by taking hold of each other's hands and jointly demanding recognition of the secret clauses in the Molotov-Ribbentrop pact and the re-establishment of the independence of the Baltic States. More than a million people joined hands to create a 600 km long human chain from the foot of Toompea in Tallinn to the foot of the Gediminas Tower in Vilnius, crossing Riga and the River Daugava on its way, creating a synergy in the drive for freedom that united the three countries.The Baltic Way was organized by the national movements of each of the Baltic States: the Popular Front of Estonia Rahvarinne, the Popular Front of Latvia and the Lithuanian Reform Movement Sąjūdis. The Baltic Way brought important changes to the history of the world. This was achieved through social unity and through the joint commitment and confidence manifested by every individual in pursuing the common goal. This impressive act of non-violent protest and solidarity whilst keeping sovereignty was a living example of the culture of peace, opening up access to information and leading to the acknowledgement of the secret treaty and its hideous consequences for the whole world. It increased the opportunity for the national self-determination of Estonia, Latvia and Lithuania and encouraged democratic movements throughout the Soviet Union. The three Baltic States succeeded in gaining their freedom in a peaceful way, creating a precedent that was, and hopefully will be, followed by a number of countries all over- the triumph of humanity over totalitarianism. Its a powerful testament that the liberation of Poland and the Baltic states from totalitarian occupation was achieved after fifty years through nonviolent resistance. Now in Lithuania, Latvia, and Estonia August 23rd has a double significance.